There are two types of gum disease: gingivitis and periodontitis. Gingivitis is the inflammation of the gums. The warning signs of gingivitis include puffy gums, traces of blood on your toothbrush, and changes in the color of your gums. Regular visits with the dentist or hygienist can control gingivitis and ensure that further periodontal disease does not progress and if properly treated may be reversed. You may be recommended to visit every three to six months. If left untreated, gingivitis can turn into periodontitis. Periodontitis is one of the main reasons why adults lose their teeth. During this more destructive disease stage, bacteria penetrate into the deeper pockets of tissue where bone and membrane support your teeth, creating an inflammation of the bone and soft tissue around your teeth. Without enough bone and soft tissue to hold your teeth in place, your teeth can become loose and fall out. In its early stages, periodontal disease is very hard to see. Treatment options are available depending on the severity of your gum condition. After reviewing your x-rays and performing a thorough exam, we will discuss non-surgical or surgical treatment options, answer any questions, and explain what is to be expected during and after the procedure, the number of office visits required for treatment, and your at-home care plan. Non-surgical treatments include scaling and root planing. This under-the-gum procedure involves careful removal of plaque and tartar from the tooth roots. 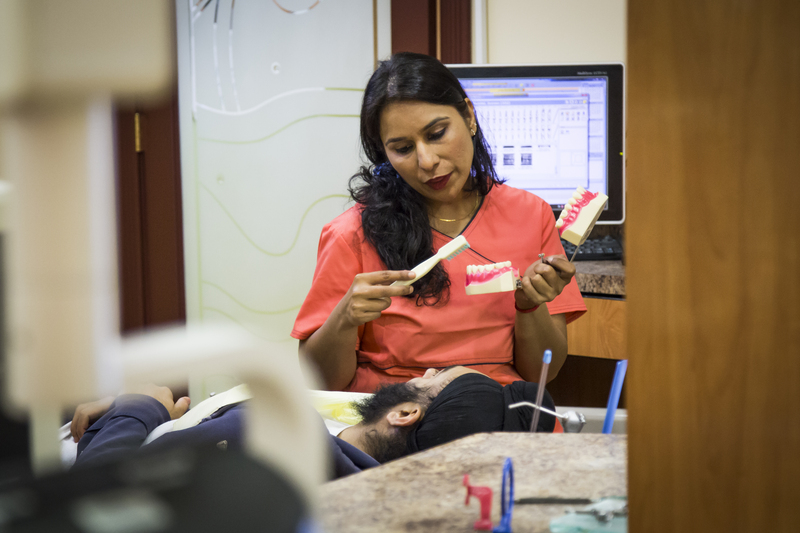 Surgical treatment options are available and open to discussion with our dentist. If you are concerned about the health of your gums, we would recommend visiting our clinic for an examination.